After Hurricane Isidore hit the west coast of Mexico in 2002 – at the time the second-most intense Atlantic hurricane to have ever struck there - local women got together to rectify the devastation, starting with a water committee. Their work started as a recovery programme, and has since blossomed into a comprehensive project for resilient guardianship of the ecosystems that give life and livelihood. With funding from the Gonzalo Río Arronte Foundation, and administered and implemented by UNDP Mexico, the Community Committee for Disaster Risk Reduction supports local water management solutions and works with regional governance to monitor and prevent the pollution of aquifers from agro-industrial waste. In addition to water management, the women from the Community Committee for Disaster Risk Reduction also harvest a local variety of oregano (Lippia Graveolens) which provides main family income and requires careful forest management and conservation. The women’s cooperative is now supported by the UNDP implemented Small Grants Programme (SGP) of the Global Environment Facility, to design a strategy to sustainably manage the oregano forest patches, and add value to the product. The sudzal farmers believe that organic beekeepers are key guardians of the forest. Each hive supports the sustainable management of more than 70 hectares, through the pollination of cash crops and wild/endemic plants; through the hives’ integral role in preserving biodiversity, wildlife habitats, healthy food chains, and the native fauna that depend on them; and by supporting sustainable livelihoods for locals. With SGP support and implemented by UNDP, the Sudzal Beekeeping Cooperative received a grant to contribute to sustain organic beekeeping on the Cooperative’s communally-farmed land, which sustains 11 beekeepers in the cooperative – and in turn reciprocally supports hundreds of hectares of forest. To ensure that this vital, sustainable, environment-preserving income stream is viable in future, SGP and PMR are supporting fair trade and organic beekeeping. The project’s conservation and improvement of 942.48 hectares of forest through management practices and tree planting also helps to mitigate climate change by increasing carbon sequestration, improving soils, and promoting the increase of biodiversity and ecosystem productivity. Floral species of interest to beekeepers have additional positive effects: protecting endemic species, collecting and dispersing seeds, and diminishing competition by invasive species. A second nearby cooperative - Flor de Tajonal SC de RL - also received an SGP grant to transition from conventional to organic beekeeping. an integrated group of women trained in honey processing and value-added production of goods such as sweets, soaps, creams, ointments, and syrups. Following Hurricane Isidore in 2002, farmers lost thousands of square kilometres of maize, along with their seeds. In response, with UNDP support, farmers launched a seed fair to share, trade, and disperse native seeds back across decimated lands. The first such seed fair was held in 2003, and has since been reproduced at approximately 30 sites across Mexico. One group, the Misioneros AC - a group of Mayan farmers that use the traditional intercropping farming system (milpa), applied for and received an SGP grant to promote sustainable development and improve conservation efforts in the Southern Microregion of Yucatan. 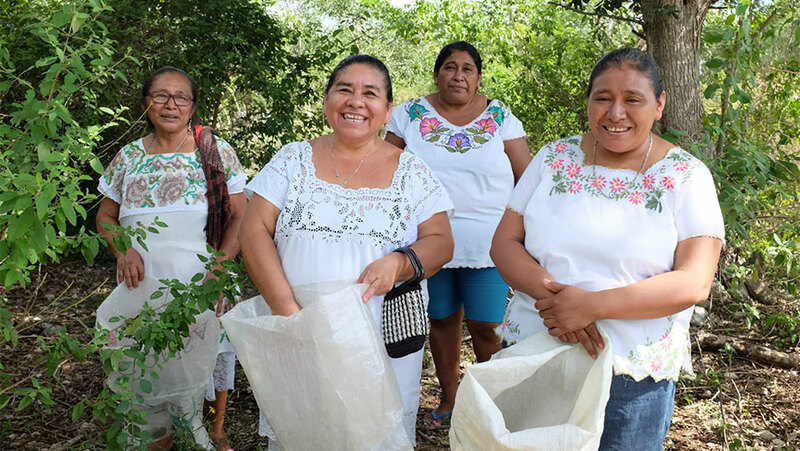 As part of the project’s activities, these Mayan farmers enhanced their milpa agricultural intercropping system - rescuing native seeds – best adapted to local soils - as a way to adapt to climate change and defend their territories. This innovative, resourceful, sustainable spirit is perhaps exemplified by the Trinity of the Milpa – squash, corn, and beans. One means of nurturing the symbiosis between healthy local soils and native seeds is via homemade local fertilisers. Locals sniff out a particular forest soil bacteria and then cultivate the microbial community, supplementing its growth with sugar/molasses and wheat bran. After two months of brewing – one anaerobic, one aerobic - the resulting slurry is a potent source of soil nutrients. Biological diversity underpins healthy ecosystem functioning and the provision of ecosystem services like clean air and water; it contributes to local livelihoods and economic development, and is essential to achieving the Agenda 2030 and its Sustainable Development Goals (SDGs). The many hands working on these projects are advancing Mexico’s efforts on SDG 1 on poverty, SDG 2 on zero hunger, SDG 3 on good health and well-being, SDG 13 on climate action and SDG 15 on life on land among others. For more information on the work of UNDP Mexico, please visit here. The story was originally published by UNDP.